Now that the mushing season is winding down up here in Willow it is time to get back to work on Forto’s Fort. 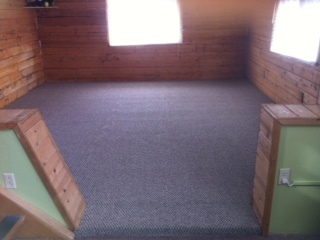 Today I had the carpet installed in the office area. It was a project that was on the top of the list. The previous owners had put down that nasty indoor/outdoor carpet and were so lazy that they cut around what looked like a queen size bed. Now when we get our huge desk and other furniture up here this summer the room will be complete and the Dog Works Radio Studio-Alaska will be up and running. I had better hurry, after my quick trip to Denver this past week it looks like my son Tyler will be coming up sooner than expected to live. Tyler also made is intentions known that he wants to be a U.S. Marine when he graduates high school in two years. When he gets here we are going to the recruiters to talk to them about deferred enrollment. Michele and I could not be more proud of our son and his intentions to serve our country!